Resource Centre > Research Gateway > Imprivata > NHS IG Toolkit v8: A Mandate For Change? 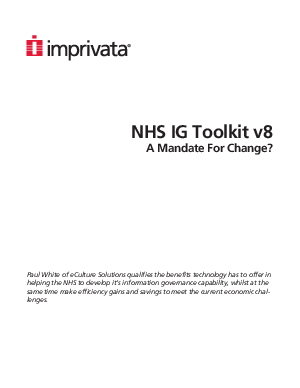 NHS IG Toolkit v8: A Mandate For Change? Paul White of eCulture Solutions qualifies the benefits technology has to offer in helping the NHS to develop it’s information governance capability, whilst at the same time make efficiency gains and savings to meet the current economic challenges.